Event lighting is a critical part of any show or performance, and BML-Blackbird’s team is extremely skilled at lighting even the most intricate productions. Special event coordinators, marketing managers and producers rely on the experts at BML-Blackbird, the behind-the-scenes boys and girls who bring it all together. We’ll illuminate your event, beautifully. With that in mind, all of our lighting services are available as part of a full-service package that can include design and coordination before your event, trucking and crew support immediately preceding your event, operators and support staff during your event and tear-down and removal crews after your event. This full-service package allows us to manage everything from your audio needs to staging and installation, as well as work with the production designer – either ours or yours – to keep an eye on the overall aesthetic and goals of the event to ensure consistency from start to finish. When you have more than enough to worry about already, partner with the one company who’s intimately familiar with all of your tastes and requirements to resolve any and all of your event production needs. It takes a skilled team of professionals to successfully execute a live show. With each performance, there are challenges of perfecting every element with a limited setup time. We understand (and even embrace) these challenges, and work with artists, lighting designers and management teams every day to relieve their worries and ensure they aren’t left in the dark. When choosing BML-Blackbird to light your corporate event, rest assured that we understand its importance and the setup it requires. We understand how crucial the overall look is to any occasion or show, and reflect that in both equipment and personnel. The infrastructure required to create a fabulous looking event is not always fabulous looking itself. Technology is sometimes messy, but our crews know that you don’t want to see the pieces needed to make it work – just the polished end product. We are experts at making the behind the scenes disappear. Our technicians also understand that discretion and privacy are hugely important, so confidentiality is always assured. Great designs mandate great showcase presentations, and lighting affects everything the audience perceives. The seasoned specialists at BML-Blackbird have been answering to high expectations for more than three decades and will bring that experience to your event. We can enhance every fashion statement you intend to make with lighting systems that will “wow” the audience. We handle both audience and runway lighting services, and we’re happy to make our event architects available as part of a package, or to work with your designers. 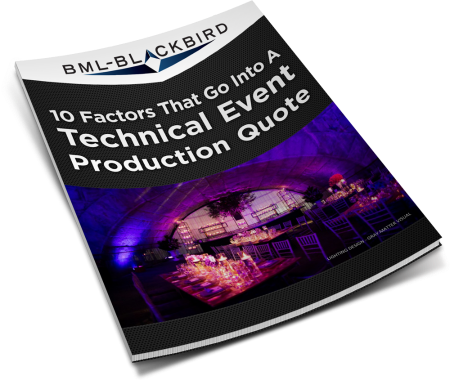 While there are dozens of factors that can affect your technical production quote, we have compiled some of the most common areas you should be aware of before you start the process. Download this eBook to see how to most effectively manage your event budget. BML-Blackbird’s inventory features full lines of both conventional lighting and automated systems. Our solutions for both touring and venue-based productions run the gamut, from one-man shows to effects-heavy live music and dance events. We can also cover installation of all needed lighting systems if pre-existing provisions don’t meet your expectations. BML-Blackbird’s vast experience has made us intimately familiar with convention center logistics. The day of a trade show can be a hectic time and it’s probable that the last thing on your mind is the quality of the lighting in your booth, or the power distribution needed to make it all happen. We can manage everything from individual booth lighting, right up to full exhibition production for event organizers. That includes the power distribution, labor, trucking, design and equipment, so you’re left with more time to focus on showing off your business. We also specialize in the unique demands of outdoor shows. Our company knows how to best prepare for the elements, while our innate flexibility and adaptability allow us to design creative solutions for the most difficult terrain. So you can put your fears to rest – we can and will adapt to your immediate needs and challenges in real time. Outdoor applications are usually large scale, in both look and design. We have the resources and skills to pull off some of the wildest lighting displays you can imagine. Whether your festival is amidst the chaos of New York City or deep in the woods of Virginia, we’ll make it an event that your guests will be raving about. For the nonprofit industry, BML-Blackbird is skilled in delivering value-conscious engineering solutions for those working within limited budgets, but this doesn’t mean you’ll have to do without the best. We understand the particular needs of nonprofit events and are dedicated to ensuring a neat, clean and organized look to both the equipment and personnel that will best suit your project. BML-Blackbird has extensive experience in lighting halftime shows, rallies and promotional events. While we all know that halftime events normally take place on-field, these other events are often hosted in outdoor venues or in difficult to access areas, mandating the creative solutions we are able to provide. Halftime shows, particularly, require the fast turnarounds that can only be met with impeccable preparation and planning, which you are guaranteed when working with BML-Blackbird. If you’re organizing a once-in-a-lifetime event, you’ll want it to be a day you’ll always remember. Every detail has to be perfect, from the displays to the DJ, to the perfect lighting to illuminate every moment. Special logistics and specialized crew support are a necessity when compiling a lighting package for touring productions. We bring our expertise to musical, theatrical and marketing tours, including traveling product launches. One further arena of expertise for BML-Blackbird is the design and control of lighting for college, university, high school and private school events. For ongoing happenings, organizers often rely on our lighting equipment rentals to minimize cost and inconvenience while maximizing satisfaction with the particular lighting product they require. We maintain a large inventory of lighting equipment in our warehouse in Secaucus, NJ, right across the river from NYC. 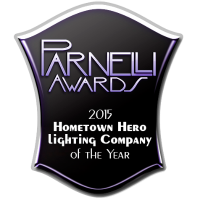 Conventional and automated lighting, LED and special effects – you just might be overwhelmed by all the choices! When you’re searching for a simple solution of renting lighting equipment (without the bells and whistles of our full-service package), we’re here to help. And if you don’t find what you’re looking for in our expansive warehouse, we can easily contact one of our dealerships and handle the whole process for you. Whether you are lighting a Broadway stage in New York City or an outdoor festival in Maryland, BML-Blackbird has the equipment you need. We are truly a nationwide solutions provider, working with clients from Boston to Washington D.C., LA to San Francisco, and everywhere in between.